I thought I would let you see what was sent to me this past week by a nice lady Glenda who found my blog. 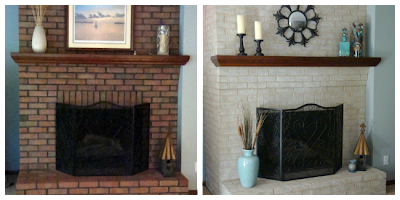 "I am so happy that I ran across your blog when I was researching “painting brick fireplaces” I was so impressed with the reviews and pictures from your customers that I decided to try it myself. The kit came very quickly, which was good, so I didn’t have time to chicken out. The video was very helpful and so was the representative I spoke with when I had a question. I am a 72 year old woman and I completed the project all by myself in a weekend! I can’t tell you enough how pleased I am with the results. My family room was dark anyway since I had a sunroom addition put on, and the dark brick fireplace didn’t help. I chose the Twilight Taupe which matches my carpeting perfectly. The newly finished fireplace really brightens up the room. My friends and family are amazed at the difference and one family member immediately ordered the kit to refinish his fireplace. 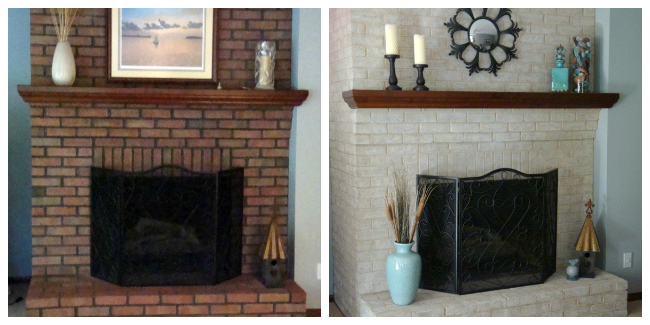 His was a 17 foot brick wall fireplace, so he ended up using 2 kits."